Robert got his interested in bees and beekeeping from a 6th grade field trip to a local museum. He kept bees through his junior high school, high school, and college years. He graduated from the University of Kansas with a Liberal Arts degree and major in a foreign language-German. He found out during his last semester of college that he was only 3 credits away from earning a minor in Biology after having taken such courses as Zoology, Botany, Human Anatomy & Physiology, and even Plant Geography besides the requisites. In 2003 and 2004, as well as 2005, he attended the Dr. Marion Ellis’s Midwest Master Beekeeping courses. He took the queen-rearing course taught by Dr. Marla Spivak and Gary Reuter while in Lincoln, NE in 2005. He has been rearing queens by grafting larvae from his own stock ever since. The American Beekeeping Federation held their national meeting in Kansas City in January 2003 where Robert attended his first national conference and became a member of the ABF. He attended several other ABF meetings and has been at national speaker, giving presentations at Louisville, KY, Sacramento, CA, Reno, NV, and Galveston, TX. His topics included beeswax soap-making and queen rearing and also mead-making. He has been rearing his own queens for the last 11 years. “Attending the national meetings puts things in a bigger world perspective. I come away with better ideas. I also love running into the authors of all those great articles in both Bee Culture and The American Bee Journal.” Since 2005, after an invitation from Katherine Kelly Robert has become involved with the urban agricultural farm movement in Kansas City, taking care of the hives as a volunteer at a local nonprofit organization, dedicated to community gardening, and teaching people about growing food in the city. This involvement has given him contacts and ways to expand the locations of several of his bee yards in suburban and urban settings. Robert has been providing financial leadership, serving as Treasurer for the Northeastern Kansas Beekeepers' as well as the Kansas Honey Producers' Associations for over 10 years. 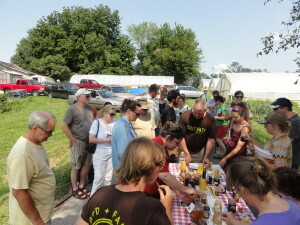 Cultivate Kansas City’s biennial Urban Grown Tour is slated for June 27-28, 2015 to showcase the good food that is growing our city’s neighborhoods and will celebrate 10 years of growth sin ce the first tour in 2005! Urban gardens are great locations for keeping honeybees as they increase the opportunity for the number of beneficial garden pollinators. They also provide and additional source of local whole food. Small-scale urban beekeeping contributes to the protection of our vital ecosystem. Keeping bees in an urban garden setting is a small but hugely significant way for a community garden to contribute to the diversity, health, and sustainability of our food growing system. It’s a huge way for a small group of people to make a difference on a big environmental issue. If your community garden wants to host honeybees, you can either (1) Arrange with a local beekeeper to place and maintain a hive or two in the garden, or (2) Start a hive to be maintained by the gardeners themselves. Maintain good relations within the garden and with the surrounding neighborhood. Research any beekeeping ordinance that might apply to your garden. Meet the owner of the property where your garden is located in order to get approval to place a hive there. Decide the best place to put the hive in the community garden. One or more gardeners should be selected to manage the beehives in the community garden. They are responsible for making sure the hive is maintained properly and for removing the hive, if necessary. When in doubt, review other Municipalities as a guideline. Some are actually pretty good. Below is a link to the City of Overland Park, Kansas, which is where I am from. It’s not the best but it is pretty good. There is a requirement for water for bees, which should stipulate that water should be supplied from March thru October. Currently reading and researching about allergy causes as well as reactions. Also reading about various treatments and articles on honey bee pollen. The scientific community says they don’t have any conclusive results. However, there are certainly many anecdotes—including my own, which is nearly 20 years old now. Beekeeping with Slatted Racks in the Midwest. Looking at the extended 3-4 month weather forecasts, and I’m wondering what I can be doing to be prepared for an anticipated cooler than average fall. I’ve decided to give slatted racks a try. They have been around since the 1970’s. I’ve been doing some research. I have a pretty good base in the screened bottom boards that I use. 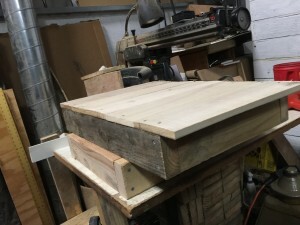 Rather than going back to solid bottom boards and making that investment for the winter weather, I decided to use a sampling for the racks on a few hives. “To the late Dr. C. C. Miller belongs the credit of realizing that bees need more room under the bottom bars. Sound as it was, the idea was never accepted by the beekeeping industry. He made two-inch-deep bottom boards and used them as long as he kept bees. Soon he discovered that bees build comb underneath the bottom bars, so the idea of a slatted rack under the frames was conceived. This served the purpose very well. Carl E. Killion, one of his successors in comb honey production, discovered the principle of the four-inch-wide solid board instead of slats near the entrance. This was a most important improvement and it did away with bees chewing the combs along the bottom bars. Still the deep bottom board and rack did not become the accepted standard of the industry. The reasons are easy to see. It takes two special pieces of equipment. The rack is fragile and is time-consuming to make. 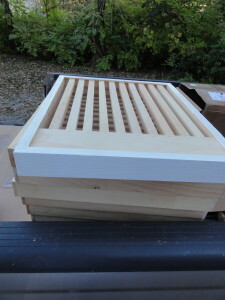 Furthermore, spacers have to be attached to prevent the bees from propolizing it to the bottom board. In a moment of ingenious thinking, Richard F. Bovard of Honolulu, Hawaii, has eliminated all these objections and has created the ideal entrance to the hive without changing in any way the equipment now in use. He has come up with the idea of a two-inch-deep frame of the same dimensions as the hive body, 16-1/4 x 20 inches. In this are fitted the four-inch-wide board and a number of 3/4-inch-wide slats. Proper space of 5/16th inch is maintained between bottom bars and slats and between the slats themselves. That’s all there is to it. It is simplicity itself. It fits under the brood chamber on top of the bottom board. It is strong and asks no favors. It can be easily attached to the brood chamber and bottom board for migratory purposes. The Western beekeeper with his standard 3/8th inch entrance can use it and so can the Eastern beekeeper with his choice of a 3/8th or 7/8th inch entrance. This rack provides a single wide entrance clear across the front of the hive instead of three separate entrances as with the Miller rack. It protects the combs four inches back from the front entrance against robbers, wax moths and winds. There is nothing to be propolized onto the bottom board. And it is free from any objections, even the most critical beekeeper might raise. It adds but little weight to the hive, three pounds to be exact. Here is a piece of equipment that should be universally accepted, just as the inner cover and telescope cover are part of a hive. It is easy to manufacture and simple in its assembly. It can be sold in the flat unassembled or factory assembled. 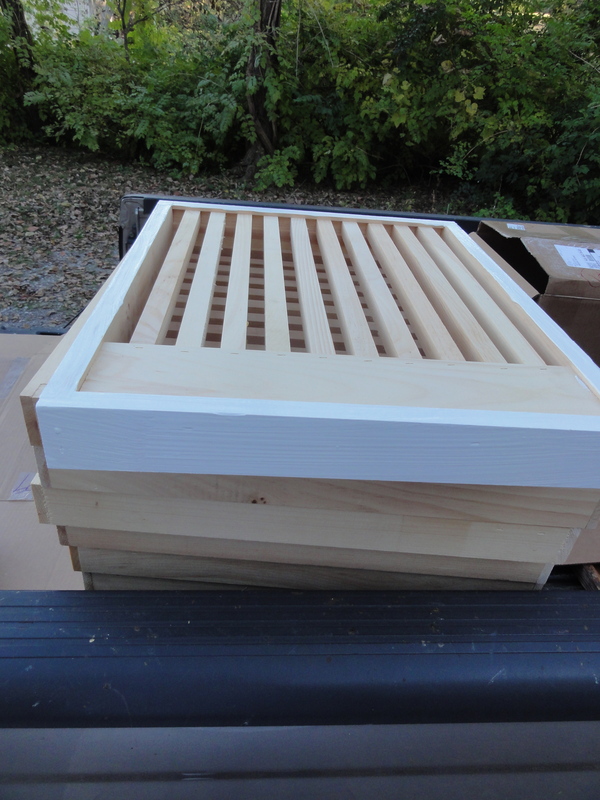 It is hoped that hive manufacturers will add it to their line of bee supplies. Beekeepers are notoriously slow in accepting new ideas, they still live in the horse and buggy days as far as their bee equipment goes, yet for their personal comfort they expect the latest gimmicks in their automobiles and trucks. It’s important for new beekeepers to understand the beekeeping cycle. This topic came about as I had been perusing a book on cattle and came across a paragraph on the subject of ‘the cattle cycle’. The book is a gift for a family member, who has been raising cattle now for several decades now. Beekeeping follows the cycles of the season. This is especially important for new beekeepers to learn and understand. The cycles differ from region to region in the country. I will only be talking about how the cycle runs for our region in NE Kansas. September to January can be considered the beginning of the new beekeeping year for the colony. The prosperity of hive depends greatly on the condition of the colony during this time of year. Diminishing colony population, beginning in late summer, along with the reduction of food sources – incoming nectar (carbo-hydrates) & pollen (protein) causes a reduction in brood-rearing. Bees born during this time of year will be the younger, longer-lived bees to carry the colony through to the next year. I like to call this reduction the ‘period of decline’ in the beekeeping season. As the temperatures begin to lower, the bees come together and form a cluster. They will break and fly on days of sun and when the temperature climbs to the lower 50’s (F) and higher. The more the temps drop, the tighter the cluster will form with the outer layer of bees in the cluster becoming tightly compressed, insulating the bees on the inside of the cluster. Clusters expand and contract with the rise and fall of day and night-time temperatures. In warming periods, when possible, the colony cluster will break and shift positions to maintain contact with combs containing honey and food resources. Colony strength in winter usually depends on the amount of food stores and the population of younger bees that would have been produced in the fall. An ample supple of pollen & honey for winter with a healthy population of younger bees produced in the fall generally means a higher spring population. The “period of growth” for the colony starts in mid-January in our area with the lengthening of the daylight, which I’ve seen by an increase in egg-laying by the queen. The new brood is not significant at first but aids in the beginning of the replacement of bees that have already died during the winter. Older bees will continue to die off but the younger bees from the new brood rearing cycle will begin their replacement. New sources of food from the Maples, which usually bloom in mid- to late February will kick the colony into higher gear for the stimulation of rearing brood. In 2013, I over-wintered each of my bee colonies in 3 deeps or 2 deeps and a medium honey super. I decided to do this earlier in the summer of 2013 as I had concerns about coming out of the hot, dry year we had just come through. Of course, when is it not a hot and dry year in Kansas? I will post pictures and blog on the progress. So far, I’m grateful for not having the worry to need to look after for feed. All hives were treated organically for mites in July/August 2013 and populations looked great in October 2013. 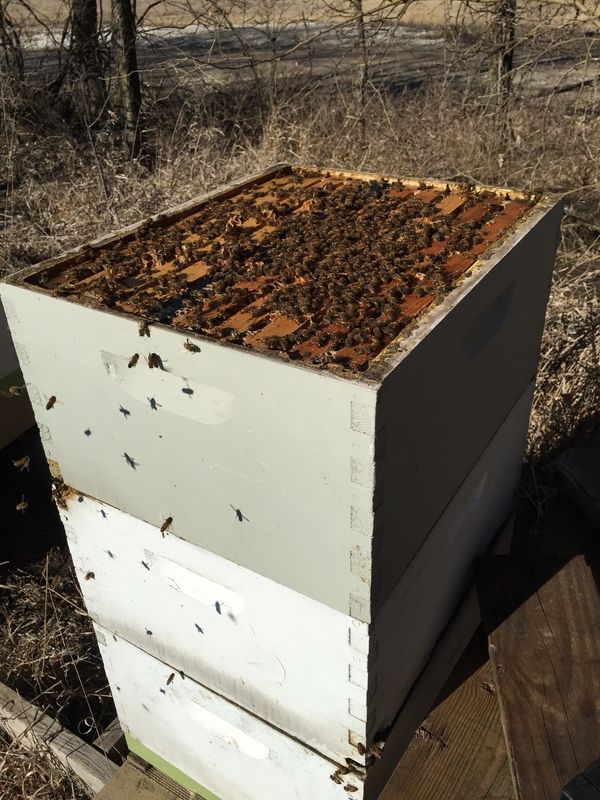 It’s standard in Minnesota and Wisconsin to practice over-wintering colonies in 3-deeps. The honey bee survival issues are complex: weather, pesticides, nutrition, beekeeper practices, diseases, mites and other pests. The weather from year to year is not exact nor consistent. Rather than continue to worry about the volume of colony size going into fall/winter and amount of honey stores, I decided to treat for mites in a timely manner-at their peak population and let the colonies hive with additional resources of naturally stored honey and pollen, as well as space for a larger colony population. Only time will tell me next early spring as winter losses are not really discernible until after the fact. The presence of mites is certainly a factor as a stressor. The survivors should come out with lots of bees, left over stores of honey and pollen so I won’t have to worry about checking for feed and stimulation. Colonies with large populations will be ready for splitting in early April when I should be able to get queen cell production in high gear. 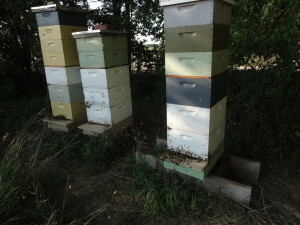 The results from last spring were that I did not have to worry about feeding the 3-deep overwintered colonies. Nearly 50% of my colonies were in 3-deeps for 2014/2015 Fall/Winter season as well. Generally speaking, the other 50% were over-wintered in 1-deep and 1-Western sized supers (7 & 5/8″), which I did have some concerns about those and I did feed at least 1 gallon 2:1 sugar syrup in November/December. I’m feed those again in early February 2015 for “peace of mind” as I’m sure they would not have made it in good shape as they had without being feed. I’m looking forward to splitting as many colonies in order to grow. After over a decade, we are going back to solid bottom boards! Kenny Edmonds, Parkville, MO., is making solid bottom boards. The price is right and the wood is good! I am following Randy Oliver (Commercial Beekeeper, Biologist) in Northern California in that it’s going to be a process of phasing the screen bottoms out. On a side note, it appears that I will be accepting 6-8 colonies for the Kansas Honey Producers’ Association state hives. The honey production from these colonies is used to supply our honey sales and promotion at the Kansas State Fair each September. Stay tuned for updates regarding the KHPA state hives. It’s a simple goal: to improve stock for local conditions in the North-eastern Kansas area. What is needed is to teach how to raise queens; how to graft larvae; learn the principals of selecting stock breeding. All that we are attempting is to trick the bees in making new queens. What I do afterwards is transporting ripe queen cells and placing them where I intend to use and need them. Record keeping is an important part of queen rearing and for the distribution of queens. Not least among the problems in this, is in actually getting information on the queens afterwards. Notes on introduction, colony behavior and performance with the new queens are the basics of what are required to allow meaningful assessment to be made. From past experience many beekeepers just don’t observe their colonies with a view to recording what they see, and it is difficult to see where you’re going if you are not looking. We live in hope. In our craft it is the norm for us beekeepers to work alone with their bees. In this project, where the planning and practical work is shared with others, one has the feeling we are participating in something really worthwhile and of real value to beekeeping in the area, that we are doing rather than talking. The enthusiasm of everyone involved in this project has been excellent, and I know I am not alone in looking forward to the next beekeeping season with keen anticipation. Italian bees, Apis mellifera ligustica – Originally from Italy, this is by far the most popular honey bee and is the default bee that most beekeepers use. Italian bees are yellow in color, relatively gentle, overwinter well and build up quickly in spring. They are easily provoked to rob weaker neighboring colonies and sometimes exhaust honey stores rapidly in winter. Carniolan bees, Apis mellifera carnica – These bees originated in the Austrian Alps, northern Yugoslavia and the Danube valley. Gray/brown in color, they are extremely gentle, conserve winter food stores well and build up quickly in spring. Carniolan bees construct new comb slowly and swarm frequently. Brother Adam at the Buckfast Abbey in England crossed a great many races of bees with the British bee in hopes of creating a superior breed. The results are what is now know as the Buckfast Bee. This bee originated from Africa. For the last several years, I have rendered my beeswax into 1 ounce sized pieces to be sold at the Kansas Honey Producers’ Association booth in the Pride of Kansas Building for the Kansas State Fair in Hutchinson, Kansas. Exploring the wonderful world of beekeeping together. The Northeastern Kansas Beekeepers Club is a not-for-profit organization dedicated to assisting current and future beekeepers of Northeastern Kansas, as well as promoting public awareness of the benefits, necessity, and value of the honeybee. Membership is open to anyone who is interested in bees or bee culture. Dues are $15.00 per calendar year (December 31 – December 31) for the first in the family joining. (Members joining after 1st October receive membership till the end of the following year.) Those joining in June or later in the year may pay $7.50 for 1/2 year. Additional members of that family wanting voting privileges shall be assessed dues at $1.00 per year. Youth memberships (18 years of age and younger) are $7.50 per year. New memberships and renewals should be submitted to the Treasurer.The association is a not-for-profit IRC 501(c)5 agricultural-educational organization; run by dedicated volunteers; supported primarily by membership dues (subscriptions). The IRC status means that the association is a tax-exempt organization. While donations are always welcome, they are not tax deductible as a charitable contribution but membership dues and subscriptions may be deductible as ordinary and necessary business expenses.The Bee Buzzer, our monthly newsletter, is the official publication of the Northeastern Kansas Beekeepers’ Association, Inc. and is published monthly. Commercial ads are accepted in the newsletter for a fee, non-commercial ads by paid-up members are accepted free for charge. The association library is free to all members. Books may be checked out at meetings and kept for a period of 30 days. The honey bee publications, The American Bee Journal, or Bee Culture, as well as The Speedy Bee can be subscribed through the Treasurer. The ABJ through association membership is offered at a 25% discount. The Association meets each month on the first Sunday at 2:30 p.m. except during the months of May, July, August, and October when the meetings will be held the first Monday of the month. The association is a non-profit organization; elected officers serve without pay. Everyone is invited to attend the meeting. Check The Buzzer each month for the actual date, time, and location. Interested in becoming a member of NEKBA? Membership is only $15 annually (January to December) and includes a member subscription to The Bee Buzzer Newsletter. Help support honey bees and the world of local beekeeping. For more information or questions about the club, please contact the any of the club officers; or write or send an inquiry to the editor, NEKBA, Attn Joli Winer, 19201 S Clare Rd, Spring HIll, KS 66083, or email me, club Treasurer. The inspiration for this page came from my mother, Charlotte Ann, who has been making this cereal since I was in my teens. Honey and grains are a natural fit. The ‘cooking’ method. Becky Tipton, my mentor, has been working on a Hot-Process soap production. I’ll have more on that process at a later date. The process I use in my out-line below is the traditional cold-process method.